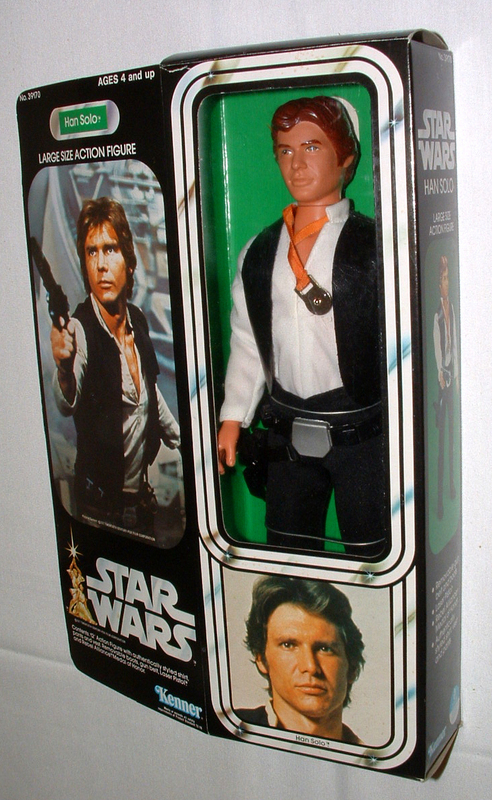 To me this is the definitive Han Solo figure. As a child I had the original figure (12 back release) but mine was the large head and that sculpt, to me, just looks horrid. 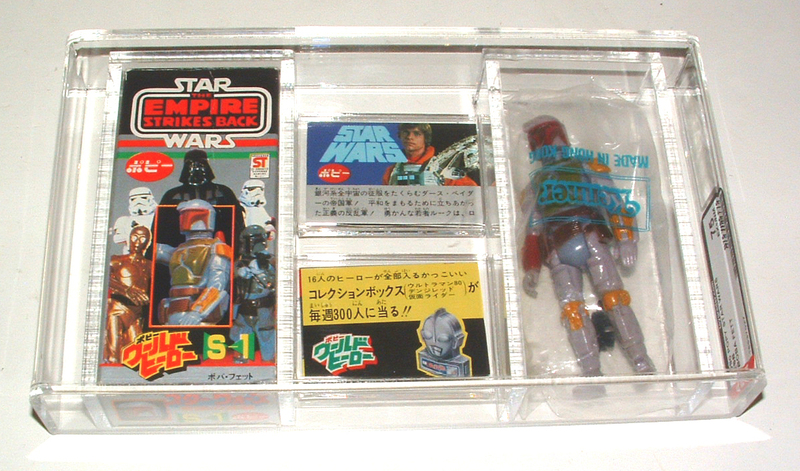 In fact I didn’t even know the small head Han existed until 10 years ago when I found vintage collecting. As I think about my kids, who watch endless YouTube toy review videos, they know every variant of every figure (LEGO mini figures) and which kits they come in. So it would be impossible for them to not know of a variant. Got to love internet / YouTube. Whilst I love the Hoth Han figure, given he is wearing that Parker as a kid I would also predominately use Han Bespin (unless I had the odd snow scene battle). 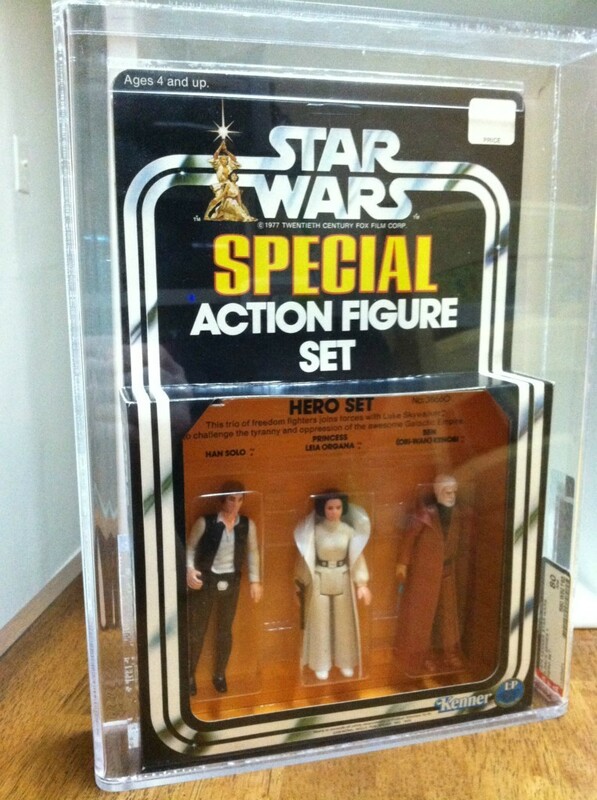 So to me this figure is the true Han Solo in Kenner (and who doesn’t love that striping on his pants too!!). As I write this intro piece I haven’t yet looked at the market. I’m thinking we will see some expensive figures. On to the data ….. The POP has been cut out – but very neatly. Amazes me the care people went to to cut a POP out for a free figure but then keep the MOC pristine. All in all I think I was a little surprised at the relative inexpensiveness of a number of these pieces. His debut card seemed priced about where your expect given some of the other 41 backs we’ve seen. There was a big drop off as we worked through the other card backs, though to be fair a lot of the pieces were less than pristine. My highlight was the proof – really nice piece and I think a good price. The trilogo was also a nice looking piece. Back to our normal schedule for the general Market Watch updates after a month off to discuss the state of the hobby. Not only did we get to veer off in a fun direction with our January updates but we also got a chance to deliver the message on the Vintage Pod as well. It was a great experience for Michael and I to spend some time telling our stories and catching up with Skye and Steve directly vs. through email. This month we find a diverse selection of items that have popped up over the last 60 days. In addition we have a roundup style review of a large Revenge Proof collection that was put up in single auctions this past month on eBay! Why: The Parker series have become fan favorites for many reasons, at the core is the fact that they fit into two of the largest areas of growth in our hobby – multi-packs and international. In addition to this piece being part of two great segments of the hobby it’s just a cool piece in general. 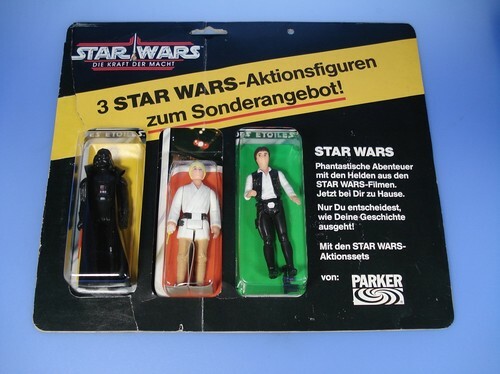 You have a lot going on between the outer packaging and the three figures, which are popular figures in their own right. A great item at a solid price vs. historic auctions, hopefully we’ll see more Parker products come up for sale in the market this year. Why: One of the favorites of the 12 inch line the Han Solo figure has seen some strong price appreciation due to it’s relative rarity to the rest of the 12 inch series. 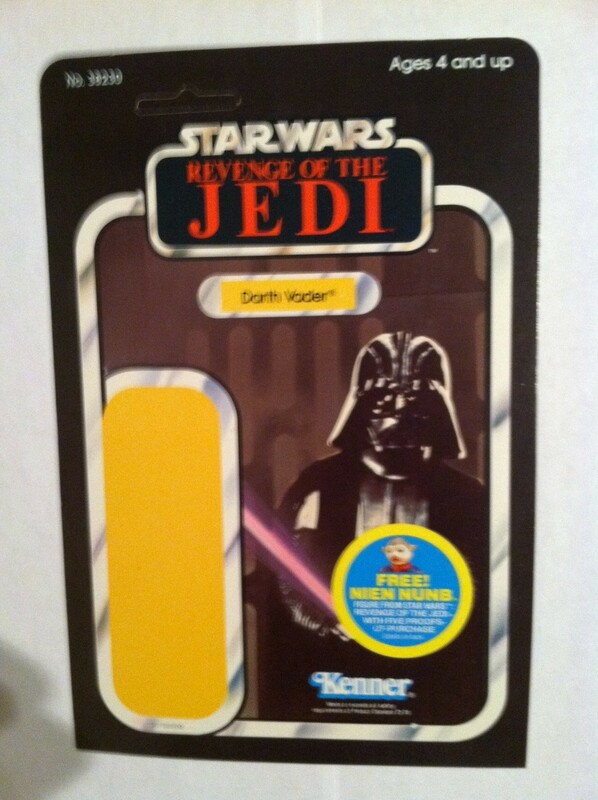 Of course we all know that the 12 inch line was short lived and eventually cut out early in the ESB toy release. Regardless the series remains a favorite of fans, and in the case of Han here; we have a great example at a premium price. The figure is overall in great condition and the seller got quite a bit given the relatively poor condition of the box. Why: One of my favorite things to post are large collections, especially when they are MISB or MOC. 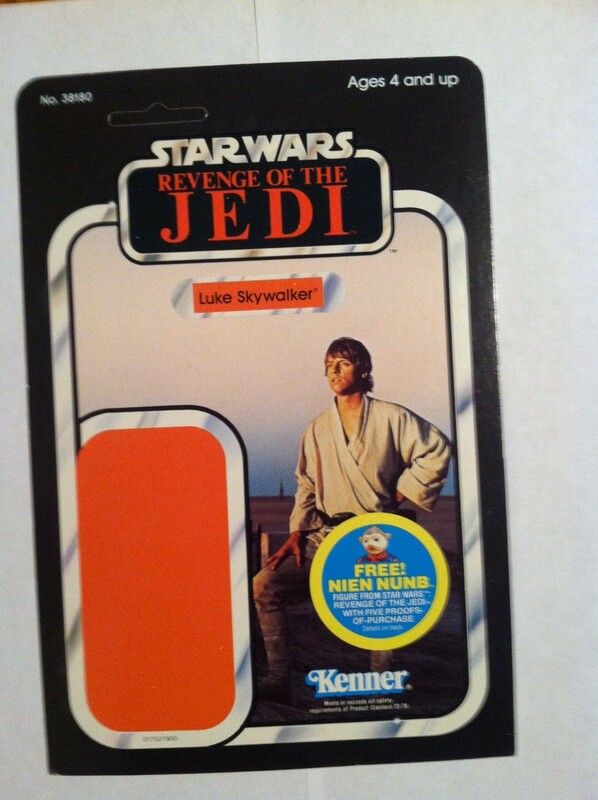 In this case we have a great example of 41 of the first 48 figures on ESB card backs. The thing that I love about auctions like this is how it could afford someone the opportunity to build up their collection with one key swipe. Literally you have 85% of the ESB MOC series down in one push, but that’s not the real fun part. The real fun comes in when you see how much you would have paid on average per figure – $178, a great price given the breadth, depth and condition of this collection. Why: Over the past few years we’ve seen several examples of some of the rarest mailers up for auction. The category as a whole has become increasingly popular with collectors over the past decade. 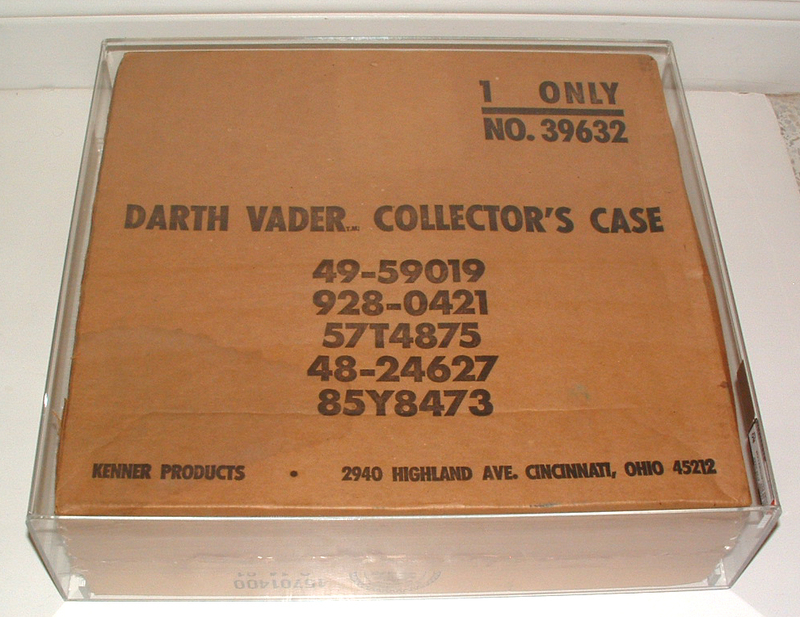 In the case of this piece you have one of the rarest and most sought after of the 93 different items that were released through retail catalogs with the original trilogy. This piece really has it all it’s a high figure count (15), it has popular characters and the thing that pushes this into grail status is the fact that it’s a lineart piece. Only a few of these sets were released with lineart boxes and it’s really a shame there weren’t more of these given how great the boxes look. All in all there are a few of these sets out there with 2 graded examples being cased over the years. 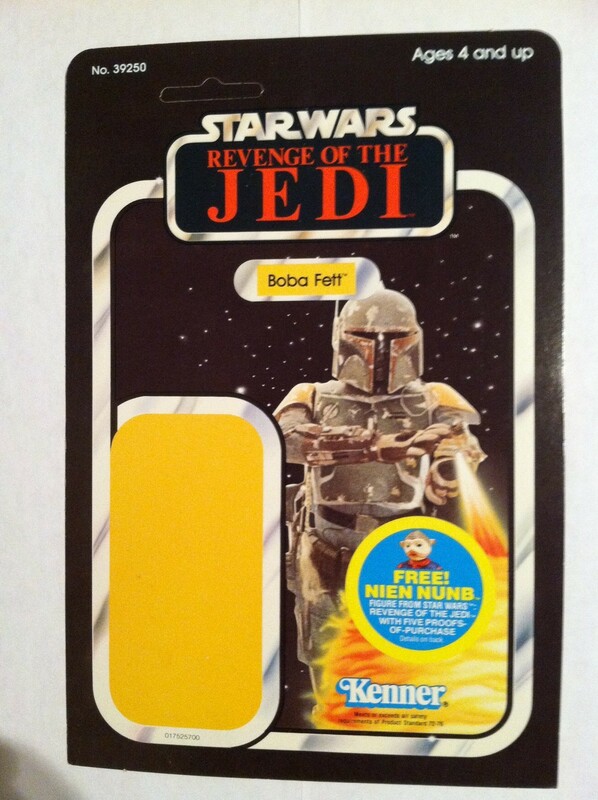 Why: Here we have a great item for the month of February a Popy Boba Fett. The Popy figures have always been popular with collectors, but over the last few years their pricing has gone up to reflect their popularity. In this example we have a graded version that received a 75 overall from AFA. Thus out of the 5 that have been graded to date this falls on the lower end of the grading scale. Still a really nice item that I personally think looks great in the case. Why: Sometimes people grade their items for display purposes, but in this case I’m hoping preservation was at the core of the reasons why it went on the trip down to Georgia. As the old cardboard on these items start to deteriorate, grading or casing in general is good solution to prevent further deterioration. Regardless of my opinion on the overall appeal of this item, I can see some logical thought processes that led to this outcome. The item is cool in that it’s still case sealed and the packaging is in great shape. However it’s plain cardboard and thus doesn’t attract a lot of collectors due to the physical appeal. Overall this was in-line with what I would expect for a going rate, but tough to read due to the overall lack of comparison to other auctions. Rarity: 7/8 – Tough to gauge just not many examples out there. Why: 3 Packs are always great items to see come up for auction, but this one was especially nice. Going for a cool $7K this baby is one of the only examples of this 3 Pack to come up in recent history. 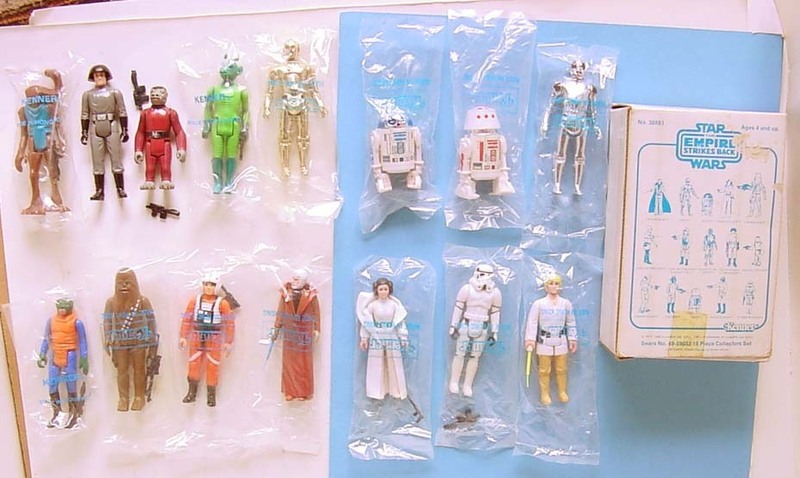 One thing is certain about the 3-Packs, they remain as popular and in as high demand as anything from the original trilogy toy line. I always par-lae the popularity of this series with that of Boba Fett as a character in the original trilogy as neither got a lot of shelf/screen time but both remain extremely popular in the Star Wars universe. This piece was in great shape (AFA 80), and ultimately went for a price which I thought was a bit low given other recent auctions. However this is the down season (January-April) for vintage Star Wars, so one could see this as inline given the time of year. All of the items were generally similar in condition, all ungraded examples and the list of items was substantial. The items generally went for just below what I would classify as fair market value. The core reason I think we saw such a swing below the line was due to the fact that this seller was new to eBay. Thus the higher demand items were closer to FMV, while the lower demand characters were sold at just below the line. This is fairly common when you have someone who doesn’t have a reputation selling off items such as proofs, there were some real steals here if you were putting together a Revenge run or even picking up a single item for a focus collection. The only major exceptions I saw to this were Darth Vader which was up substantially to FMV of roughly $400-$600 in previous auctions. There were a few that were up slightly to the current market, let’s say 10-20% or so, including Chewbacca, Jawa, Luke/Han Hoth and Luke Bespin. But with overall trends showing some growth in value these may be new norms given increased interest in the franchise. The proofs went in a few waves with a lot being sold during the second week of listings, including some of more expensive items such as Luke Tatooine, Darth Vader and Boba Fett. Rarity – 6 across the board. Price – 3 ($165) on the low end to 6 ($1428) on the high end. Well that wraps up the review for the month of February 2013, please take a chance to review Michael’s review of Luke Bespin and the IG-88 highlights from last month. Coming up in March we’ll have a review of the results of some unique items from the John Kellerman collection via our friend Jeff at Jeff’s Collectibles, as well as highlights of the February market as whole.